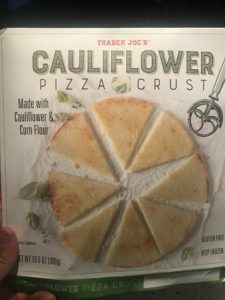 Ingredients: 1/4 Zucchini, 1/4 Red Bell Pepper, 1/4 Yellow Bell Pepper, 1 Table Spoon Olive Oil, 1/4 cup Pizza Sauce (your choice of brand), 1/4-1/3 cup of Mozzarella Cheese, a dash of Garlic Salt and 1 Trader Joes Caulifower Pizza Crust. Cooking the Pizza Crust: Preheat oven to 450. Remove all packaging from the pizza crust and place on a cooking sheet. Cook each side for 10-12 minutes. Remove crust and add the pre-prepared toppings. Prepping the Vegetable Toppings: Thinly slice zucchini, red bell pepper and yellow bell pepper while pizza crust is cooking. Preparing the Cheese: Only use freshly grated cheese. Please do not use pregrated cheese. Why doesn’t pregrated cheese get moldy? Add Sauce and Toppings to Pizza Crust: Pour or spoon approx 1/4 cup of pizza sauce on to center of crust. With a wooden spoon spread sauce, circularly and evenly towards the edgers. Leave approx 1/2 inch (20mm) of exposed crust around perimeter. Cheesing the Pizza: Spread the freshly grated cheese evenly over the sauced part of the pizza. You should be able to see a little color of the sauce through the cheese. Adding Vegetable Toppings to the Pizza: Spread the zucchini in an evenly spaced pattern over the cheesed part of the pizza. Add a three or four rings of each of the red and yellow bell peppers over the zucchini slices. Final Touches: Do a quick, very light sprinkle of garlic salt over the cheesed part of the pizza. Finally, lightly drizzle olive oil around perimeter of exposed crust and a couple drops on each of the zucchini slices. Final stage of cooking: Turn the oven on low broil and cook the thinly sliced vegetables until they reach the desired tenderness without over cooking the exposed outer edge of crust approx 2-7 minutes. Remove from oven and place on a cutting board and divide into six even slices. Dig in and enjoy! 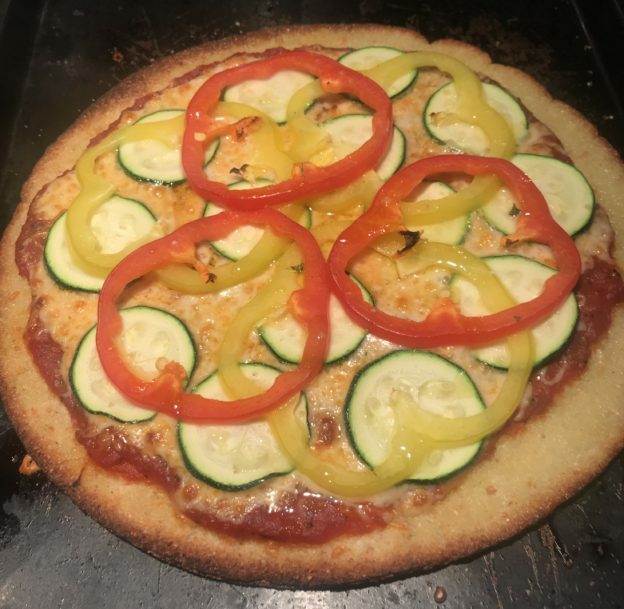 This entry was posted in Recipes and tagged cauliflower, gluten free, Healthy Pizza, Healthy Pizza Recipe, Italy, Vegetarian Pizza on June 6, 2018 by Jason Hennessey.